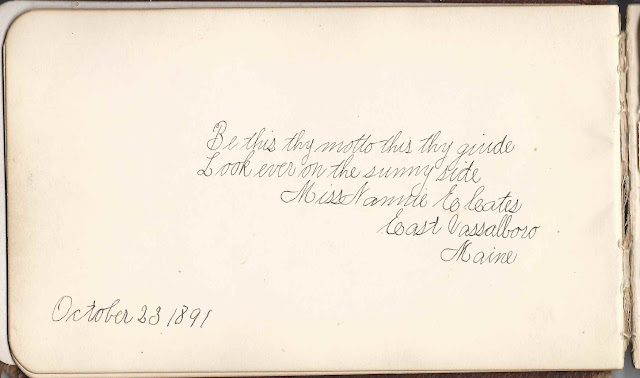 1890s autograph album that apparently belonged to a student who attended East Vassalboro High School at East Vassalboro, Maine, and, subsequently, Dirigo Business College at Augusta, Maine. None of the signers indicated a kinship with the owner that might have helped with identification. 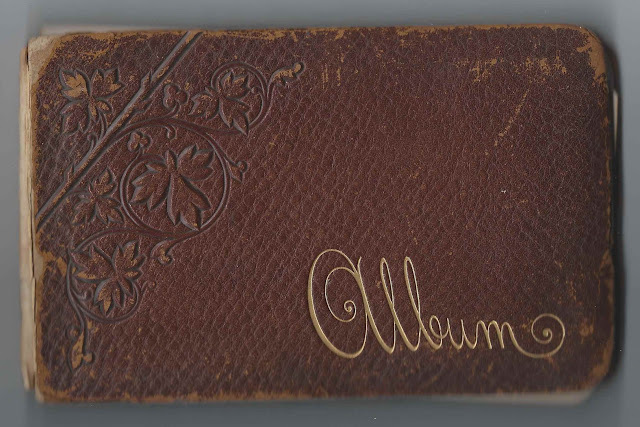 Perhaps a reader familiar with the owner's family or familiar with East Vassalboro would know of a student who attended both of those institutions and who didn't sign a page in the album. The album is approximately 7" x 4-1/5" with puffy covers and contains 60 pages of sentiments signed by instructors and schoolmates of the owner. An alphabetical list of the signers appears at the end of this post. Miss Nannie Cates of East Vassalboro, Maine left a sunny sentiment on 23 October 1891. 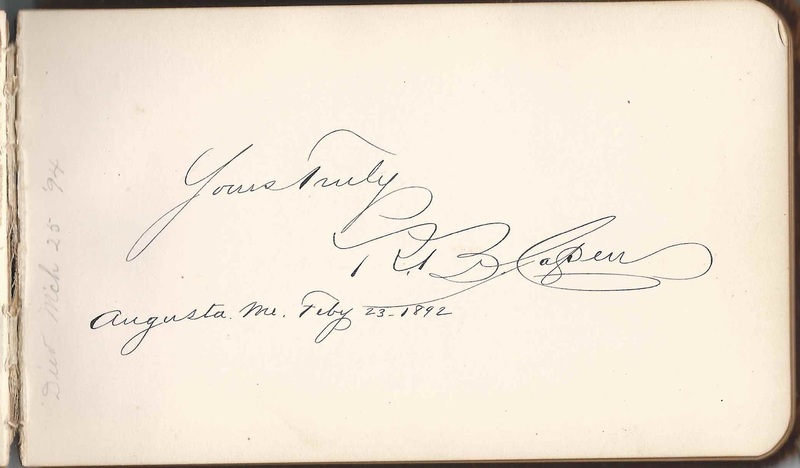 R. B. Capen, president of Dirigo Business College, signed a page on 23 February 1892. Someone, presumably the owner, left a penciled message that Mr. Capen died 25 March 1894. See the list below for the names of other Dirigo Business College officials who signed pages in the album. R. P. Kunze signed a page at Dirigo Business College on 9 February 1891. I found his name online listed as R. Paul Kunze. 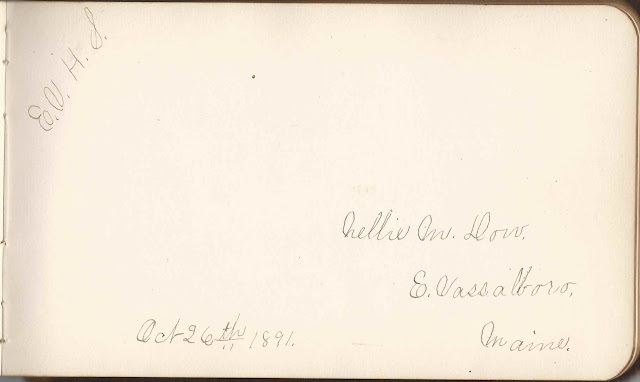 Nellie M. Dow of East Vassalboro, Maine, signed a page on 26 October 1891 and wrote the initials E.V.H.S., presumably East Vassalboro High School. 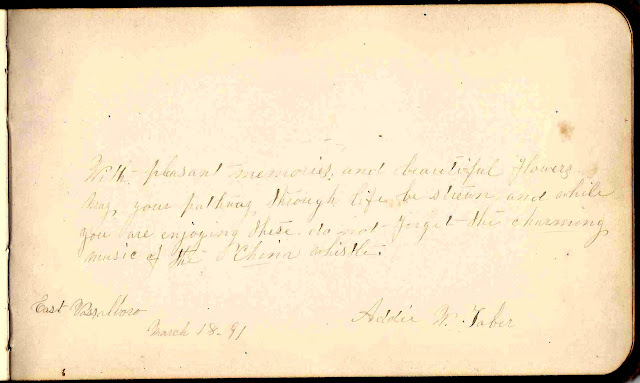 Addie W. Taber signed a page at East Vassalboro, Maine, on 18 March 1891 and mentioned the "China whistle". The ink was very faint, so this image had to be tweaked for the sake of legibility. Was the whistle from a railroad locomotive or a steamship on China Lake or was it perhaps a whistle calling workers to a factory? 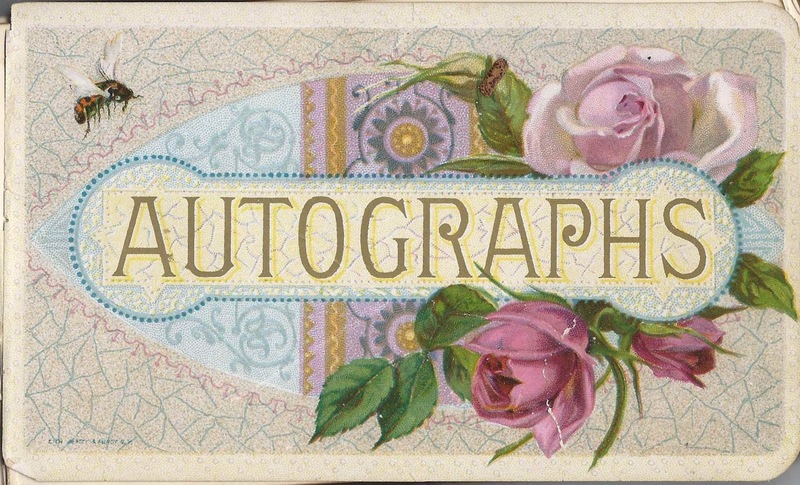 The owner made a note on three pages that the signer had died: 1) R. B. Capen, as noted above, died on 25 March 1894; 2) Nelson Shorey of Augusta, who died in 1894; 3) A. L. Marr of Canaan, Maine, who died in 1894. If you have a theory as to the album owner's identity or information on any of the signers listed below, please leave a comment or contact me directly. Thanks! Annie H. Blish of East Vassalboro, Maine, signed on 23 October 1891 "All my best wishes are for thee"
Willie B. Blish of East Vassalboro, Maine, signed on 26 October 1891 "Remember me"
R. B. Capen, signed at Augusta, Maine, on 23 February 1892 "Your truly" Written in pencil along the edge: "Died Mch 25 '94" He was president of Dirigo Business College at Augusta, Maine, which the album owner apparently attended, as well as several other signers. Miss Nannie E. Cates of East Vassalboro, Maine, signed on 23 October 1891 "Be this thy motto, this thy guide. Look ever on the sunny side." Charles Alton Cavanaugh of Windsor, Maine, signed on 10 November 1892 "Declimation Snow"
Florence Dishwater of Augusta, Maine, signed at Dirigo Business College on 13 February 1891 "Before I'd be an old maid." "Diagonally situated"
Lillias A. Dyer of Etna, Maine, signed at Dirigo Business College at Augusta, Maine, on 24 March 1892 "Your friend of Commercial Law Class"
C. O. Gardner of Augusta, Maine, signed 23 February 1892 at Dirigo Business College. Treasurer of the College. "Yours truly"
Harry L. Given of South Windsor, Maine, signed on 10 November 1892 "Windsor Academy"
Etta M. Gowen of Windsor, Maine, signed on 2 June 1893 "Your friend"
J. G. Hanson of weeks Mills, Maine, signed on 17 March 1891 "The degree of success depends largely upon the amount of courage possessed." Miss Effie L. Hersom of Belgrade Mills, Maine, signed at Dirigo Business College on 13 February 1891 "Remember Sat. 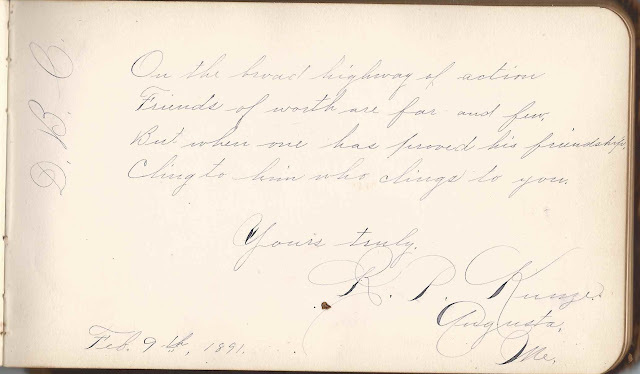 Feb. 7, 1891" "Your friend"
Carrie E. Jones of South China, Maine, signed on 8 October 1891 "Ever your true friend." Carrie E. Kelley of North Whitefield, Maine, signed on 14 March 1892 at Dirigo Business College at Augusta, Maine "Yours truly"
R. G. Leonard of Augusta, Maine, signed on 11 February 1891 "Yours truly"
Sadie F. Lord of Belgrade, Maine, signed at Dirigo Business College "Remember the lecture at the State House Feb. 7, '91"
Angie M. Mansfield of Orono, Maine, signed on 22 February 1892 at Dirigo Business College at Augusta, Maine "Yours Truly"
Carrie E. Mansfield of Augusta, Maine, signed at Dirigo Business College on 14 March 1892 "Your Friend"
A. L. Marr of Canaan, Maine, signed at Dirigo Business College on 12 February 1891 " 'By hook or by crook I'm the last i your book.' Yours Truly" "176 bbls" "McGinty" Written in pencil along the edge: "Died '94"
Herbie Merrill of Windsor, Maine, signed on 10 November 1892 "Yours truly"
Berton O. Moody of South Windsor, Maine, signed at Augusta, Maine, on 13 February 1891 "Remember Feb. 7th" "McGinty"
Jennie B. Moore of Augusta, Maine, signed at Dirigo Business College on 16 March 1893 "Don't get flustrated" "Yours Truly"
Clara A. Pratt of Windsor, Maine, signed on 10 November 1892 "Ever your friend"
Miss Mary F. Priest of East Vassalboro, Maine, signed on 23 October 1891 "May all thy life be blest with the joys thou lovest best"
Alice M. Robbins of Riverside, Maine, signed at Dirigo Business College at Augusta, Maine, on 17 March 1892 "C.L." "Truly your friend"
Nelson Shorey of Augusta, Maine, signed at Dirigo Business College on 17 February 1891 [Written in pencil along the edge: "Died '94" "I've looked These pages o'er and o'er To see what others have wrote before And in This quite [perhaps he meant "quiet"] little spot, I plant one sweet 'forget-me-not' "
Addie W. Taber, signed at East Vassalboro, Maine, on 18 March 1891 "With pleasant memories and beautiful flowers May your pathway through life be strewn and while you are enjoying these, do not forget the charming music of the China Whistle"
E. S. Turner, signed at Augusta, Maine "Respectfully" Business Manager at Dirigo Business College. 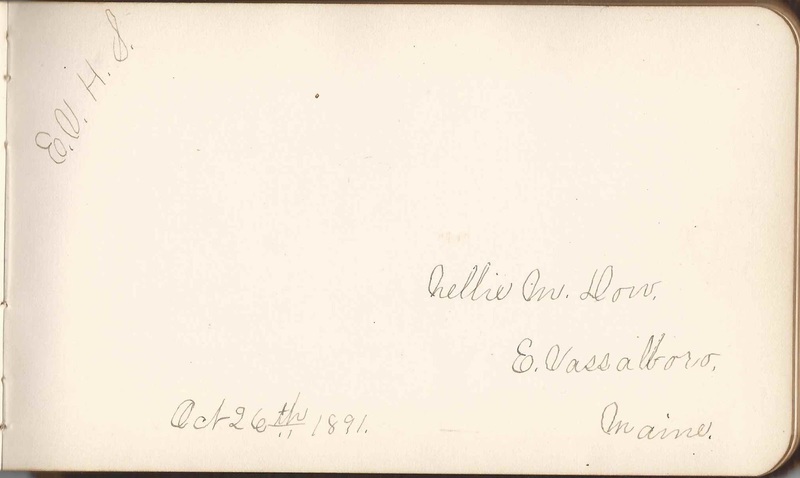 Lottie L. Weeks of East Vassalboro, Maine, signed on 22 October 1891 "Remember me"
All of the Cates’s are my relatives. My family’s homestead is a block from the former East Vassalboro Highschool. My cousin, who lives in the house, gave me a ton of old calling cards that were in a box marked “Nannie Cates” and some of the names listed in your post are also on the calling cards in the box. Thanks for commenting about the Cates homestead. Love those old calling cards! Carrie Mae Jones was my grandmother and I recognize the Dow and Priest contributors as friends of hers. Carrie married Robert Ross Webber of East Vassalboro. They were both educators.